Neon Tetra Breeding - How To Breed Neon Tetra Fish? Neon Tetra Breeding – How To Breed Neon Tetra Fish? Neon Tetra, with their shining scales and silver, red, and blue streaks, are one of the highest selling freshwater aquarium fish. There are also black neon tetra and green neon tetra variations, named for those exact colorations. Neon Tetra are peaceful by nature, and can be easily bred at home. 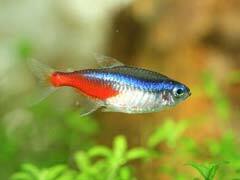 To breed Neon Tetra, you will need several tanks ready for the breeding and egg laying process. A tank well suited for breeding will have no scavenger species in them (including snails), and keep the temperature of the water around 70-72 degrees. Sterilize the tank ahead of time, and the water should have a pH as close to 7.0 as possible. Introduce the prospective parents into the breeding tank. Be sure to use limited light as they are quite sensitive. A female will be slightly rounder than a male, and when ready to lay eggs she will be significantly so. The mating rituals are quite short, and the female should be laying eggs by the end of 24 hours. At this point, you must remove the Neon Tetra parents from the tank, as they may eat eggs or fry. As the eggs hatch, a 1/2 cup of infusoria-rich water twice a day will feed the fry for a few days. At that time, micro worms will suffice. Then at the end of that week place in plenty of brine shrimp for the young Neon Tetra. This process can be tricky, the hardest part being balancing the water, and preventing bacteria from causing any kind of Neon Tetra disease. However, with a little patience and a few tries, you should get a successful school of young Neon Tetra.